After all a few people will feel the same as poor old Martini Bianca not naming any names of course. 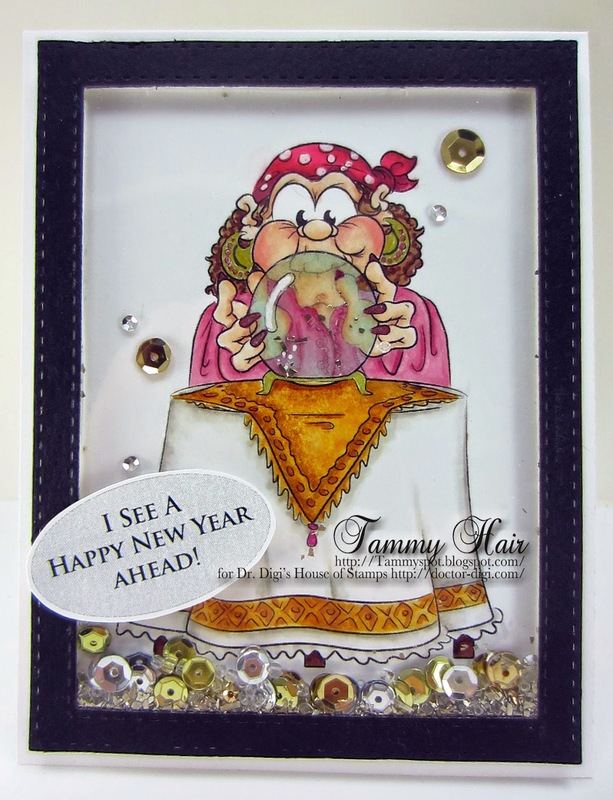 I hope you had a fabulous Christmas and that you will have a very happy crafting New Year. 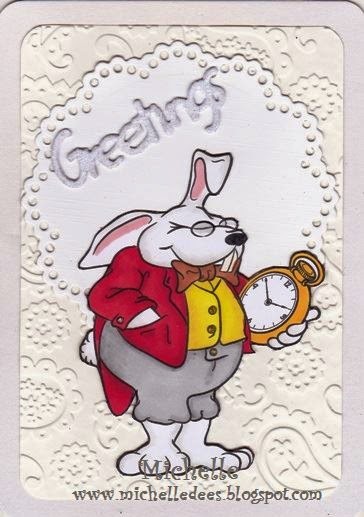 I love the movie "Alice in Wonderland"
And of course the White Rabbit cannot fail in it. I made him this time. The card is all white so he looks great on it. He hopes he is on time. HERE can you find my blog. HERE you find all the other great digistamps. 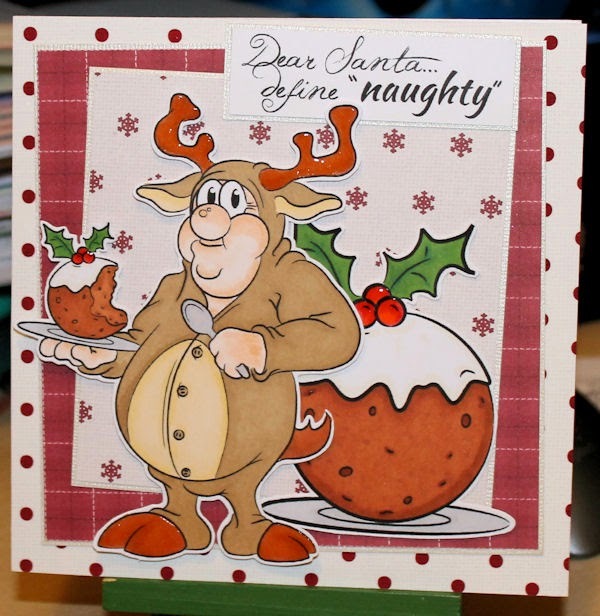 Here's wishing all Dr.Digi's crafters a very merry Christmas and a fantastic new year... now where's the mince pies? Santa does enjoy a good sing-a-long and he's made sure this year that despite what Mrs Claus says, he is getting an upgrade on his karaoke machine! And here he is making the most of it! After all that Christmas shopping what better way is there to relax. So go on and have a lovely soak in a bubble bath! I have a friend that is constantly worrying about the future. I decided to help my friend so I sent her for a in-depth reading by the astounding Mystic Mabel over at Dr. Digi's House of Stamps! Look what Mabel has predicted for ALL of my friends! Well, it won't be long now, and we'll be dressing in our Christmas outfits and eating plum pudding....no? Hmmm maybe we are missing something. 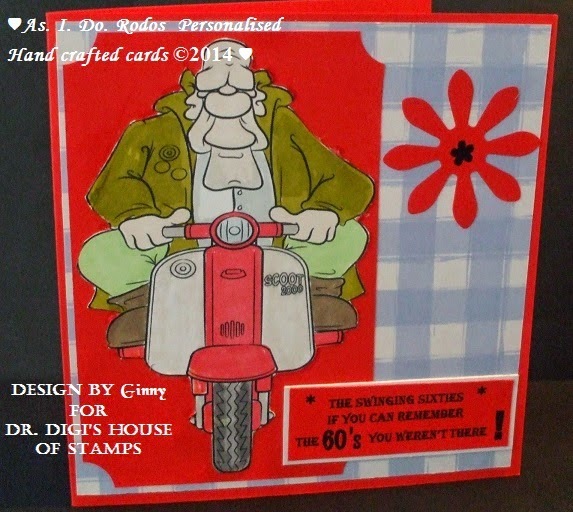 Here I have another fun image from Dr Digi's House of Stamps, titled Christmas Chris. He looks like he's enjoying himself! I hope you do too....Merry Christmas everyone! Am sure many of us need rescuing at Christmas, whether you have been stranded at the local station because the last bus just went, or run out of sprouts just before the big event, or realised that the eggnog will be more nog than egg (no I have no idea what I am talking about either), the rescue squad will be on their way. Granted they can't provide you with much more than a warm drink ( by warm I mean brandy warm of course not tea warm) and a lift on the back of Chief Rescue's skis but they are the 6th Emergency service after the RAC and the AA (for our American viewers the AA is the Automobile Association rather than anything to do with Alcofrolics)! You can find the Rescue Squad HERE and I hope you all have a wonderful Christmas and a Happy 2015. Just when you thought you'd seen it all, Chris turns up in his festive onsie complete with antlers and red nose. To be fair, its not as bad as it looks as its plenty roomy - great for all those puds! 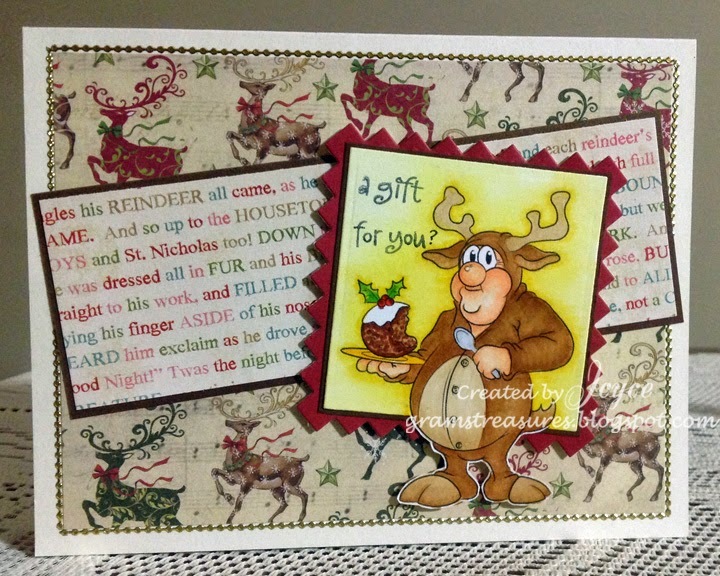 Christmas Chris is available in the store; sentiment from the Christmas Sentiments Sheet 01. A perfect combination! 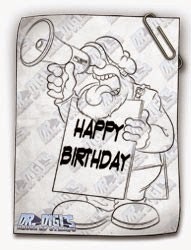 When it’s your birthday you just want to shout it from the roof tops. Mr Speaker will do it for you with his loud hailer and he does it with so much panache! Mr Speaker (birthday) comes like this I have altered it. HERE more details on this card can be found over on myblog. Where is he going our Melvin. He is on a drive in a new year. Yes he is getting older and hopes the new year will be better as last. I wish him all the best for the new year in his life. HERE can you find Melvin the Mod. 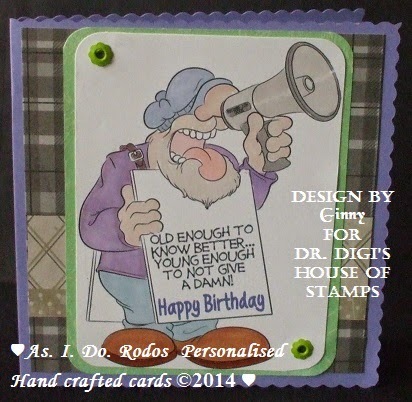 If you like to see more about the card take a look HERE. Have a nice weekend and see you in the new year. Don't they make a handsome couple! 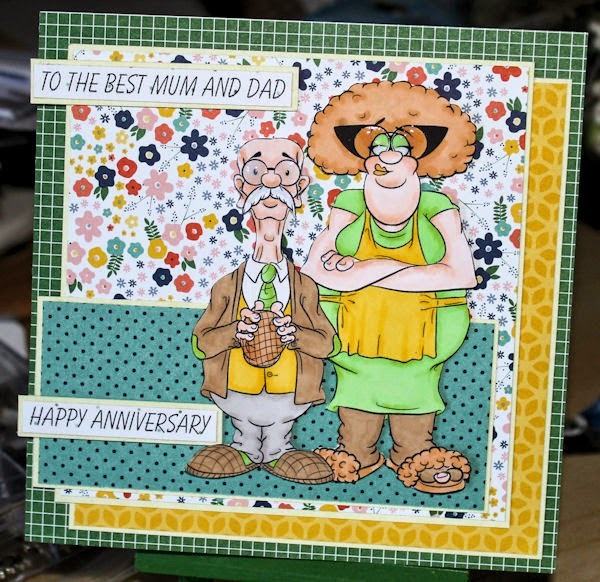 I don't really do lovey dovey cards so Dr Digi couples likeDerek and Deirdery and Morris and Mildred have become my go to couple for weddings and Anniversaries. This time round it's the turn of Derek and Deirdery Dunderton, they say opposites attracts and these two are no exception, Derek has his pigeons to keep him occupied and Deirdery likes nothing better than a slice of pigeon pie! Oh dear. You really would not want to be a snowman with all the occupational hazards. 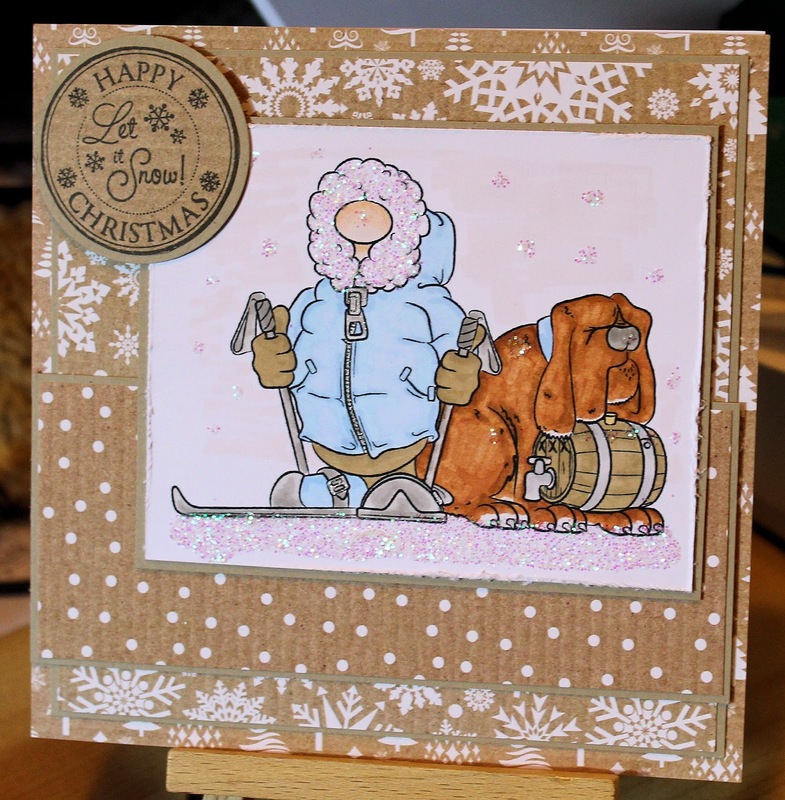 Snow Fun is available to buy from the store - sentiment is part of a wonderfully phrased Christmas Sentiments Sheet 01. A perfect Christmas combination! It’s the weekend and you are out with your friends! With one or two fruit juices downed and before you know it you are up there with the Karaoke mike in your hand. But karaoke is not meant for people who can sing is it! 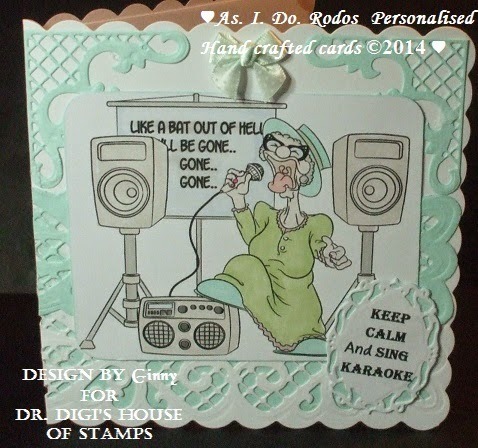 This brilliant image is Bat outta Hell You will find her along with lots of other fabulous image HERE more details on this card can be found over on myblog. 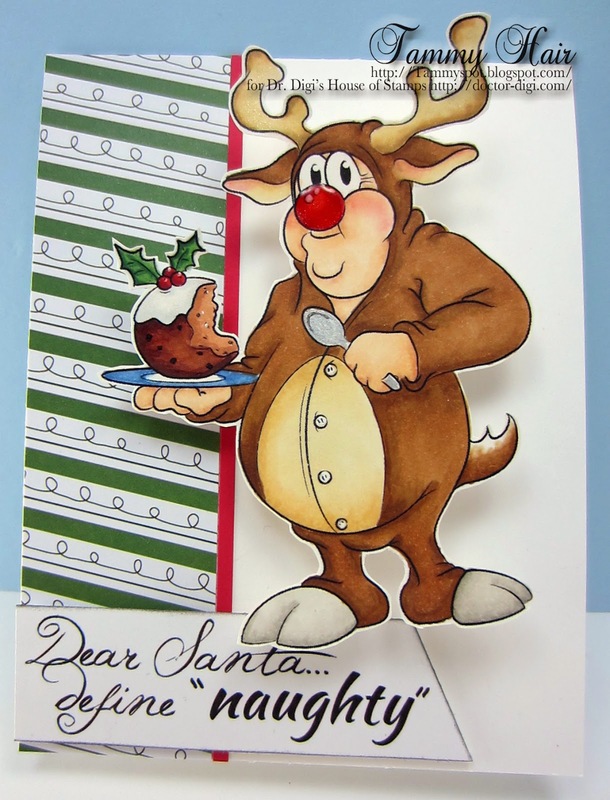 I suppose that if Santa considers pilfering the plum pudding from the table before the other guests have a taste as naughty, then Christmas Chris from Dr. Digi's House of Stamps, is guilty! Guess who is only getting coal in his stocking this year! I'm sure you have all heard it said, that 'getting old isn't for sissies'? Well, neither is winter! So, here is the perfect image for all those snowbirds, or wannabees, that head south for the warmer climes. 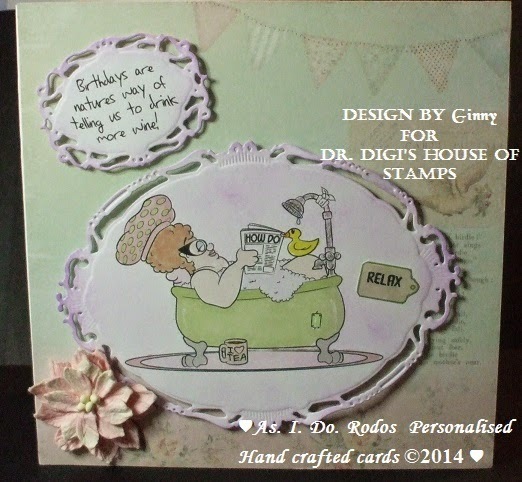 This is another fun image from Dr Digi's House of Stamps, and you can find it here. You know how it is, you go to a party, head for the buffet table and overload your plate! Well Chris here is a huge lover of Christmas pudding so he is in seventh heaven. Forget your mince pies and pigs in blankets, bring on the pud! Reminds me I still need to get mine, I am the only one who eats it, the boys do not know what they are missing! You can find Chris Christmas HERE and his oversized pud HERE (total bargain at 50p!) and you can find the Doc's new sheet of Christmas sentiments HERE and if you order all three of these together you will save yourself a £1, so the pud is technically free, how good is that? 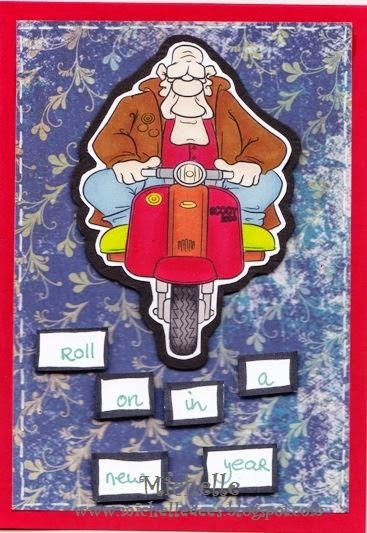 Have a good weekend, I will be wrapped up in my thermals on my friend's market stall tomorrow so think of me, brr! Santa is making a list, and he's checking it twice. Especially for all those gardeners out there! I have a feeling that I'd be on this naughty list! Naughty or Nice is just waiting to be coloured up in the store! They say if you can remember the 60’s you weren't there! Well Melvin the Mod still lives in the sixties. He reminisces about his weekends in Brighton with pleasure.